CNS): While residents might think that heading for the top of Mount Trashmore is about the safest thing to do in Cayman if a Tsunami is heading our way government officials took place in a collaborative table-top exercise Thursday at the Government Administration Building to work out what really should happen. Organised by the Foreign and Commonwealth Office (FCO), the exercise tested the emergency preparedness of FCO representatives in the Cayman Islands, Jamaica and the Dominican Republic, as well as staff in London. Exercise Sunseeker, involved an imaginary tsunami coming ashore on Grand Cayman on Seven Mile Beach in the vicinity of the Hyatt hotel. The fictional tidal wave also adversely impacted Jamaica and the Dominican Republic. Governor Helen Kilpatrick who led the local response said the exercise aimed to foster collaboration between the UK and local emergency agencies. Front-line representatives from Bermuda and the Turks and Caicos Islands as well as the FCO’s London and Miami offices also took part. 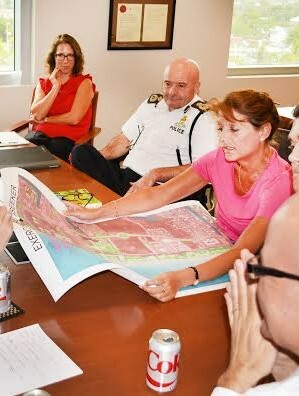 Local representatives included Hazard Management Cayman Islands (HMCI), the Royal Cayman Islands Police Service, Government Information Services, and four local consular representatives who were observing the process. The exercise concluded with a debriefing, which took a critical look at the management of the simulated crisis. The debrief participants focused on areas they might review to better strengthen preparedness. These included the timing of any initiation of the Governor’s Emergency Powers, as well as a need to fine-tune communications between the UK and the Cayman Islands. The exercise was a timely precursor to the annual two-day Hurricane Preparedness exercise scheduled to take place next week.